Men and women push cart of fish along tracks to warehouse. Women clean large fish fillets in water trough. hd01:00CIRCA 1960s - A meeting with a general is shown and troops climb out of a helicopter and a floor map is used as military tactics are evaluated. hd01:29CIRCA 1950- A woman breaks up a fight between two men a man drinks from a pond, and a man attempts to barter with a couple in the wilderness. 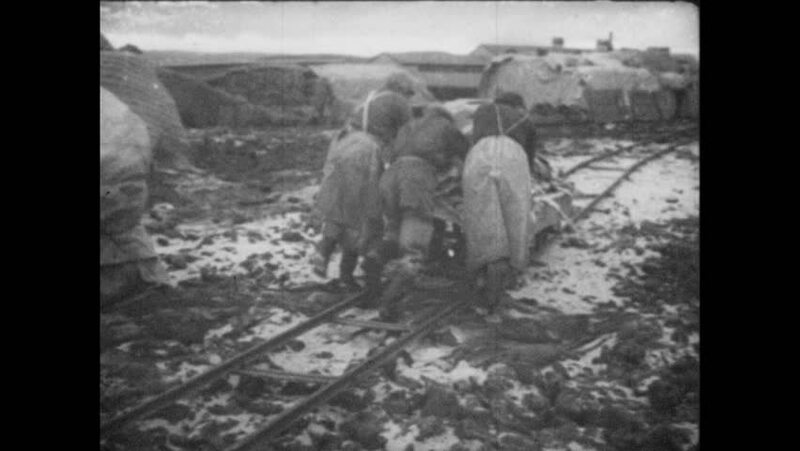 hd01:00CIRCA 1918\xD1Men toss materials, move lumber, dig ditches, hack trees, and build buildings in Northern Russia. hd00:40CIRCA 1943 - Germans work to fortify positions in the Siegfried Line. hd00:58CIRCA 1950s - Captain Karl Zimmerman asks Lieutenant Tom Dreisenstock about his experience defending the Pusan perimeter in South Korea. hd00:231930s: Car drives on street through flatlands, luggage attached to top and sides. Car with trailer drives on street. Front of car, license plate with text “Oklahoma 1938”. Broken car. Temporary camp.